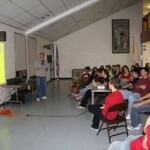 Our high school program here at St. Mary Catholic Church, serves students in grades 9 through 12. We shatter the stereotype that church is boring! 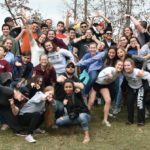 Our programs are created to celebrate our faith and life in a way that is fun for all teenagers and welcoming to those who are not Catholic or affiliated with any faith. We offer social programs to our young people so that they may have fun and fellowship with one another, which allows our young people to build healthy, faith-based friendships. We also offer spiritual programs that strive to connect our young people to the teachings of the Catholic Church and guide them to learn more about how to grow in their own relationship with God. As teens enter high school it is essential for them to continue building their relationship with God and their peers; below are the programs we offer to facilitate this process. Not only do we strive to feed our young people spiritually, but we also do it physically. Following the 5 pm Youth Mass, on Sunday’s that Youth Group meets, we provide a dinner for all our high school teens beginning from 6pm-7pm. 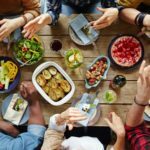 This is an opportunity for our young people to enjoy a meal with friends and the adult volunteers that minister at Youth Group in order to build and continue establishing deep relationships with one another. There is no cost, but donations are always welcomed. Following the CYM Dinner, we gather to feast on the richness of our Catholic faith. We begin with icebreakers and games to get to know one another. Then we engage our young people in discussing topics about our faith, the Church and current issues occurring in their lives. Small Groups are heavily used in our Youth Group which allows teens to break up in smaller numbers (4-7 teens per group) and dive deeper into the topic at hand. All high school age teens are invited. Friends are always welcomed. You don’t have to be Catholic to come, but know that we will be talking about the Catholic faith. Youth Group begins at 7 pm and ends at 8:30 pm. Meeting Wednesdays, from 6:30 pm – 8 pm in the John Paul II house. 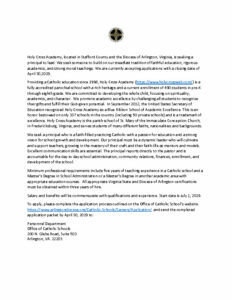 For High School teens interested in going deeper in their Catholic faith. We’ll discuss theology, Church teaching in a teen-friendly small group format that is engaging and dynamic. 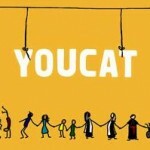 We are calling it YOUCAT after the new Youth Catechism that was released at the 2011 World Youth day by Pope Benedict XVI. 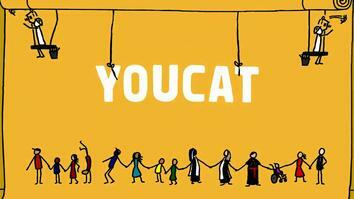 This catechism will be the main resource utilized during meetings. weekend. Retreats are one of the best things that we do in Youth Ministry so don’t miss it! Every January our youth head to the Eagle Bank Arena and Washington, D.C. for a morning of prayer and praise at the Diocesan Life is Very Good Rally. We have Mass with Bishop Burbidge, hear musical performances and inspirational talks from national/international speakers. We then head to the March for Life in Washington, D.C. in prayerful protest and March to the Supreme Court building for an end to Roe vs. Wade. 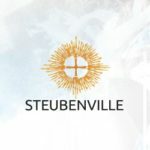 For the past 40 years, high school youth from across the United States have had their faith awakened and their hearts set on a fire through a personal encounter with Jesus at a Steubenville Conference. With an exciting lineup of speakers, musicians, and presenters, the High School Youth Conferences will challenge Catholic youth to stand firm in their faith, rely upon the awesome power of Jesus Christ who is their guide, friend, and Savior, and to show that faith to the world. The conferences are held in the summer (usually in July) and require a commitment in mid to late January to attend.